Thank you for submitting our quote form! You'll be receiving an email shortly confirming all details, and pricing will be locked in for 30 days. If you have any questions in the meantime, please feel free to contact us. We understand our customers work on tight budgets and next day deadlines. We're here to help. Use these fields below to get a quick quote or give us a call to help you find the right price for your budget. 1. Have Us Create Your Artwork You have an idea and need assistance on your artwork. 2. Upload Your Artwork You have artwork ready to go at the time of placing your order. 3. Upload Your Artwork Later You'll place your order now and can upload/email artwork at a later date. We don't ship your order until YOU approve your final artwork proof. When Do You Need This Item? We'll use the date you specify above to compare against our production time when planning for delivery. A YPP representative may be in contact with you after you place your order to verify your in-hands date. 1. Residential You're shipping this to your home. 2. Commercial You're shipping this to a business. Lock in your FREE quote today! Pricing is based on the information provided above. An e-mailed quote will be sent to you for your records. For a custom quote please e-mail info@yourpromopeople.com. 3 important reasons why we need your zipcode. About Custom Designs: Pick from a variety of popular designs and layouts that our customers love. You can always customize the design too. Please add comments in the designated area titled 'Tell Us About Your Artwork Needs' on this page with any specific changes you may have. This fluted stadium cup is similar to the smooth cup but with a ribbed exterior. This makes it easier to grip in your hand and easy to carry and display your company. 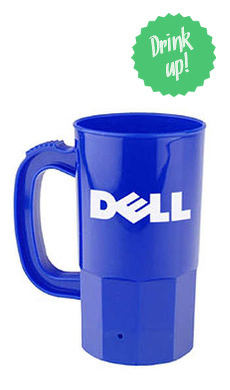 This cup comes in a variety of colors and great for your logo. Able to hold over a typical cans worth of liquid this drink is great to show off your logo. With multiple color options it can fit almost any occasion and promote your company simultaneously. This cup is also available in 22 ounces. Straws and lids are also available for a spill free experience. Want to learn more about our promo items? We hope these help. Are all of your cups and inks BPA, Cadmium & lead free?What is your policy on over/under runs?Is same day production possible?Is there a convenience fee to use credit cards?Is special packing an option? Enter Your Question Need something answered, ask below.